I slept in today – I usually do on a Saturday – and it was after ten before I was out and about with Mix. 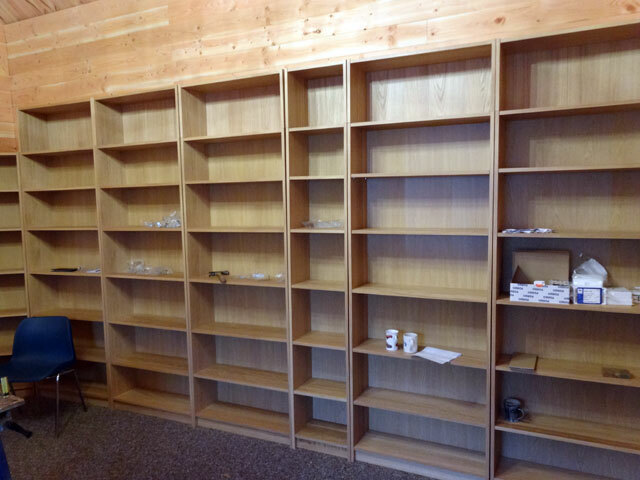 We went to work in the Bothy, putting together some more bookcases. I would have spent the day at it but two of Digger’s friends, Alan and Liz, arrived and after showing them around our bit of the estate, we all had lunch together in the farmhouse. It was a lengthy lunch and it was quite late before I returned to the Bothy – and stayed there only briefly because Rachel wanted help removing Christmas decorations from the attic above the bedroom. Once that job was done I did retire to the Bothy and do a bit more work before joining everyone else in the farmhouse for a fish supper. In the evening Rachel and I watched another in the series of Montalbano stories on BBC4. As usual it was excellent. We walked the dogs together and then retired for the night.